How to create Christmas email signatures with CodeTwo Email Signatures for Office 365? 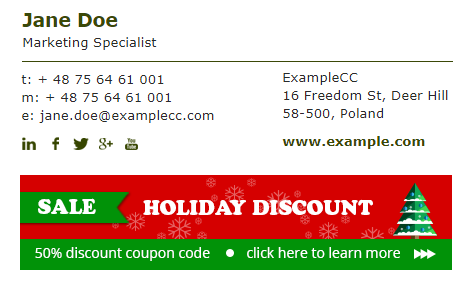 Christmas is around the corner so it is a good idea to think of setting up Christmas-flavored email signatures. By adding promotional banners to your Office 365 signatures, you can easily inform your customers about special offers, discounts or updates to your opening hours. Let’s see how these and other tricks can be done using – CodeTwo Email Signatures for Office 365. 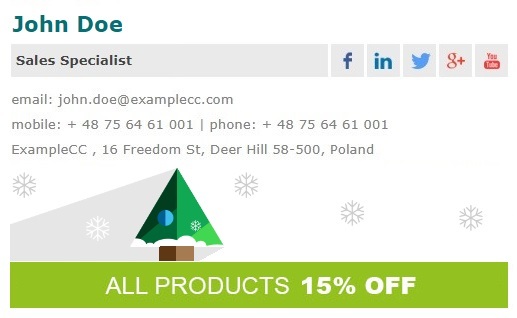 The easiest and the cheapest way to alert your customers about your Christmas special offers is to add marketing banners to email signatures. Banners in signatures are your free marketing space that you can use for multiple purposes. You can promote your Christmas slogans, inform recipients about your seasonal discounts, or simply wish everyone “Happy Holidays”. You don’t need to stick to just one Christmas theme. CodeTwo Email Signature for Office 365 allows you to set up different banners for different senders. This way you can diverse banners between e.g. Sales and Marketing Departments addressing various business needs. Banners can also link to web sources. And if you add a special tag to that link, you will be able to collect some statistic data about your Christmas campaigns’ performance. Customers know that during the Christmas break your business may not be available as usual. And even if you plan to work normally over the Holidays, this may not be obvious to your customers and business partners. So to avoid the guesswork about your opening hours, simply add this information to your signatures. You can use CodeTwo Email Signatures for Office 365 to plan your Christmas campaigns in advance. The built-in Scheduler option will help you here. 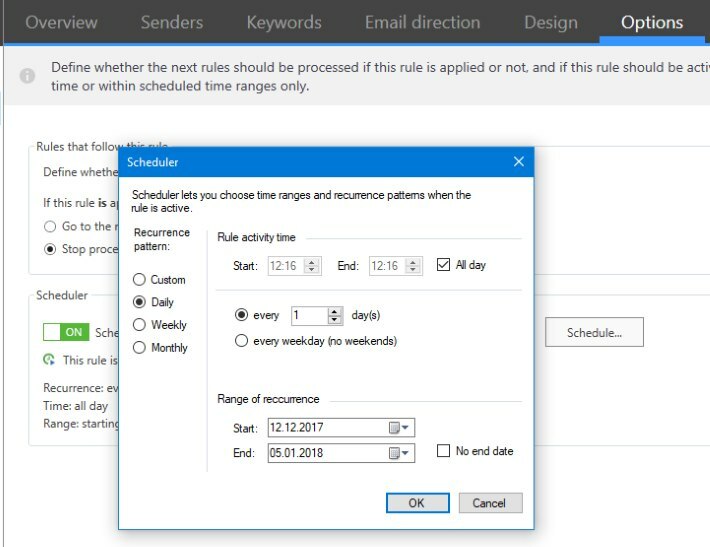 It provides an intuitive and easy-to-use panel where you can quickly select very specific time ranges for your rule’s activity. For more flexibility, you can schedule activity period for each email signature rule individually. 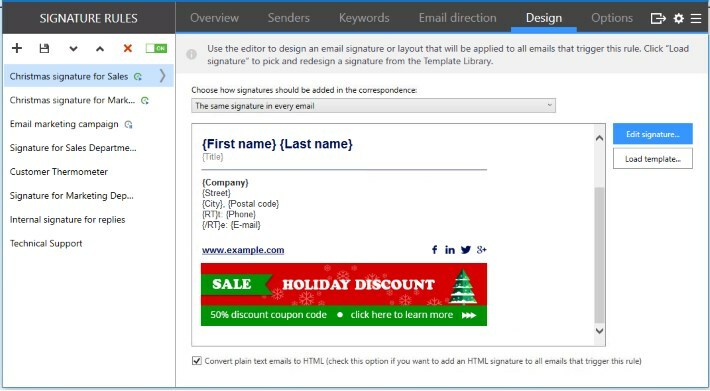 With CodeTwo Email Signatures for Office 365, you can set up your festive email signature with just a few clicks. In fact, you can set up as many Christmas signatures as you like. And if you decide to have different templates for each department, the application is ready for that. To make signature setup easy as 1-2-3, you do not even have to create the signature from scratch. Instead, you can load one of the predefined signature templates from the program’s library and tailor it to your needs. And if you prefer to plan Christmas campaigns ahead, the Scheduler feature will come in handy. 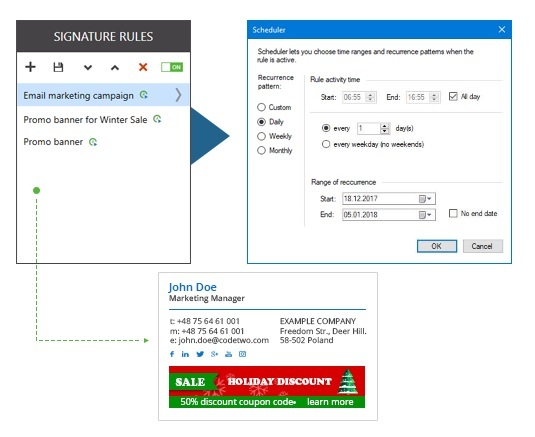 Once you have set up the rule activity ranges, you can be sure that your holiday season signatures will be automatically added to emails at the right time. 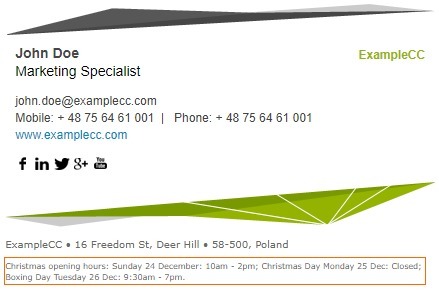 Ready for your Christmas email signatures? If you are a user of CodeTwo Email Signatures for Office 365, simply log in to your account in the User Panel and start designing your own festive email signatures. New to CodeTwo Email Signatures for Office 365? Start your free 14-day trial today!